•	B.Sc. in electro-optical eng. Senior C++ Developer לסטארט אפ מבטיח ברחובות! Job Requirements:Senior C++ Developer לסטארט אפ מבטיח ברחובות! 5+ years of work experience as a C/C++ developer. Understanding and work experience with OOP paradigm/ design patterns. Experience with OpenCV – Advantage. Experience with Python/ C# – Advantage. B.S. Computer Science or equivalent experience. At least 2 years of experience as a team leader. At least 5 years experience of actual employment in development roles. Experience with frontend technologies like React. Experience with server-side languages like Node.js, Python, .Net (optional). Experience with database technologies like SQL Server, MySQL, PostgreSQL, and MongoDB. ניסיון מחברות סטארטאפ וגם חברות מבוססות וגדולות יותר. 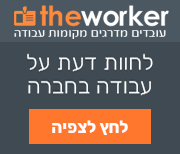 ניהול של מחלקה בת כ-70 עובדים ומעלה. Job Requirements:Proven R&D leadership experience of 10+ years.